Staying organized is obviously a big key to success as a service-based business owner. But with countless hats you need to wear to keep your business running smoothly (not to mention needing to manage multiple clients and maybe even contractors), staying on top of everything can definitely be a challenge. In my own business, I use a few simple apps and tools to help me stay productive and manage client work effectively. Which tools and apps are my must-haves? Well, I’m a big fan of many of the apps and tools included in Google Suite (known as G Suite). In this post, I’ll share the specific tools/apps I use most often, plus some tool-specific tips and hacks I use to stay next-level organized in my business. Star System. Starring emails lets you mark high-priority messages with a variety of colored stars. This way, they stand out from the rest of your inbox. I star emails when they’re part of an active or ongoing project. Labels. Gmail allows you to create labels for emails and organize them by topic, client, project, etc. When I label an email, it means it contains something relevant, upcoming or current. It’s not immediately actionable, but I don’t want it to get lost in my inbox. Plus, Gmail auto-creates a folder for each label, so you can move emails from the general inbox to specific folders to minimize clutter. If I don’t add a label or star to en email, it means it’s not a priority message. If you’ve ever used Boomerang, you’ll get the hang of Mixmax in no time. 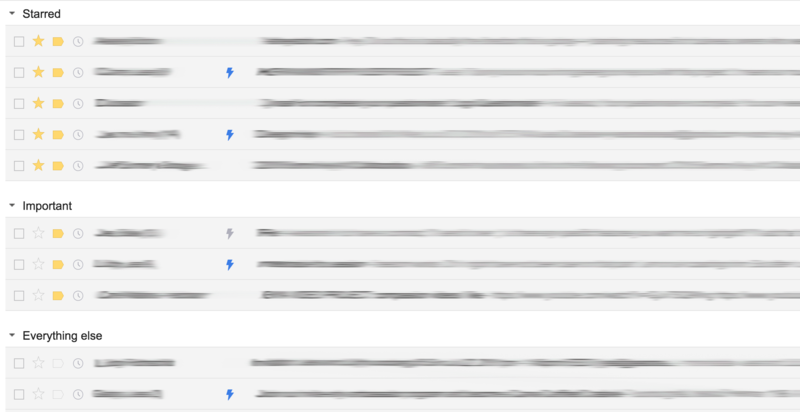 This Chrome extension allows you to track who has opened or interacted with your emails sent from Gmail or Google Inbox. I find this to be especially useful when working with prospective clients. If they’ve opened my emails, that tells me that they’re probably very interested in working with me. I always follow up no matter what, but it’s nice to have this extra insight regarding potential new clients. Here’s a bonus tip: if you work on long-term projects with clients, consider adding an event to your calendar for the duration each project you book. This way, you’ll always know how many client projects you have going at any time and can avoid overbooking yourself. Even if you’ve never used Google tools before, consider how you might be able to apply these simple tips to whatever tools you do use. Many related tools/apps these days have similar functionality. If you want to dive deeper and find out more ways you can get organized with successful time-saving systems and processes, download my Business Wellness Plan now.